For best results, be sure this window is maximized. Click an empty white square in the puzzle grid and a question box will appear. Type your answer in below the question and click Enter. Repeat the above steps until you have filled in the entire puzzle grid. To check your answers, click Check Puzzle (located below the puzzle grid). Incorrect answers will be highlighted in black. Don't know the answer to a question? Click Solve and the answer will appear in the puzzle grid. You have completed this crossword puzzle, powered by EclipseCrossword from Green Eclipse. 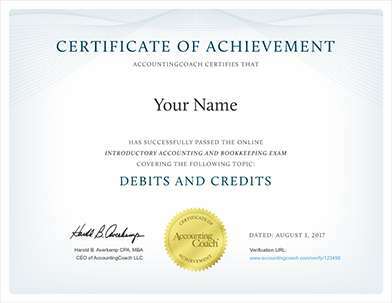 Receive instant access to our 500+ Flashcards when you join AccountingCoach PRO.